Karen joined the Playschool staff in 2014 after having been a permanent substitute in the Yellow Room for almost seven years. Karen is a Playschool alumnus as well as her three children. Karen graduated in 1991 from the University of Delaware with a B.S in Pyschology. In 1993, she earned her M.S. degree in Rehabilitation Counseling from Northeastern University. Karen worked in the counseling field specializing in adults with major mental illness. Karen is involved in her children's activities which include swimming, baseball and gymnastics. She enjoys playing games with her kids, reading, cooking, gardening and anything that is outdoors. Miss Jean has been a resident of Charlestown Township her entire life (90 years!). She met Miss Betty initially when she was 10 years old on a visit to Broadwater Farm (Miss Betty’s former home) and began helping at Playschool when she was 14 years old. One summer, Jean worked at a preschool in Santa Fe, New Mexico while her husband Elmer was working and attending college, returning again to Charlestown. During her years at Playschool Jean progressed from a helper to a teacher’s aide and was Miss Betty’s assistant for many years, which is how she received her certification as a teacher. Jean eventually became the lead teacher in the Twos Room (now the Yellow Room) for well over 20 years. From 1983 to 1992 Jean and her husband lived (and Elmer worked) in Houston, Texas. While in Texas, Jean volunteered at St. Jerome’s Early Childhood Center for eight years. 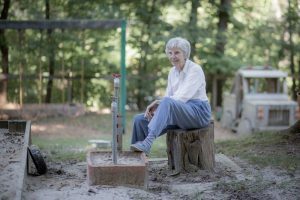 During the years they lived in Houston, Jean returned to their home in Charlestown three or four times each year where she continued to help at Playschool. 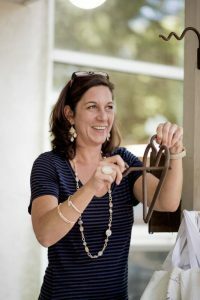 In addition to continuing to support our teachers in the classrooms, Jean is very involved with the Charlestown Sale and the Alumni Children’s Committee for the Bazaar. Jean says her claim to fame is having both Faith Koons and Kevin Bacon as former students in her Twos class! Pam started her children at Playschool in 1964 having learned about it from her neighbor. Pam says that she learned so much from Miss Betty and all the teachers and other parents. The Charlestown Sale was the twice-a-year reason to go through your house and sell what you were not using. All the many work parties were times to make friends and help the school with fundraising. Playschool was a big part of her and her family’s lives. Pam has had four children and six grandchildren graduate from Playschool and also from Miss Betty’s camp, including her daughter, Miss Alyssa (Orange Room teacher). When she is not working at Playschool, Pam also works at Gheel House, a residential mental health facility, helping with cleaning, cooking, and laundry, and providing friendly support to the residents. 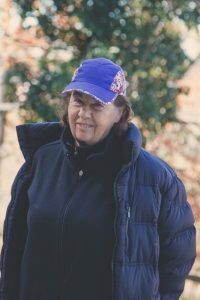 For two weeks each spring and fall you can find Pam spending most of her spare time volunteering at the Charlestown Sale, and each summer you’ll find her running our summer camp program with Miss Alyssa.